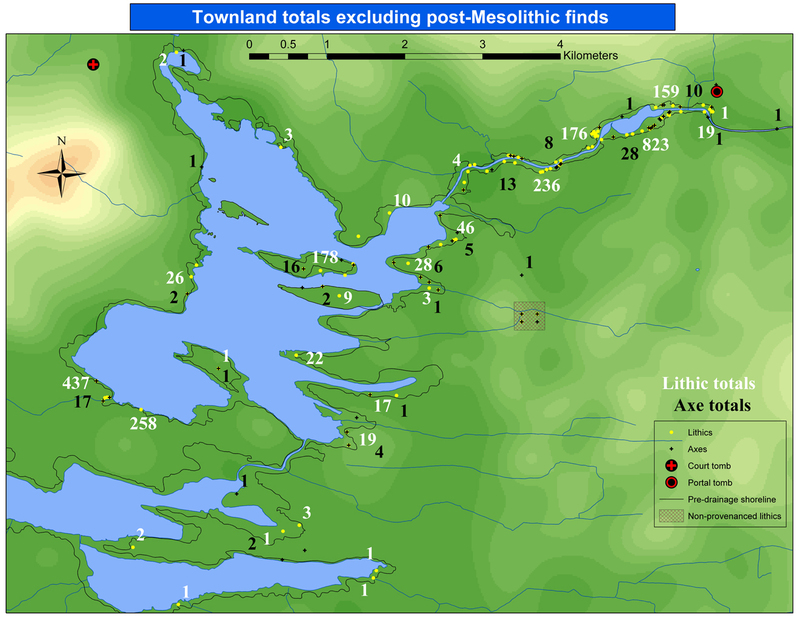 This thesis sought to review the evidence we have for the Mesolithic communities who inhabited the west of Ireland for approximately 4000 years. The aims of this thesis were to understand the character of the early prehistoric period in the six counties west of the Shannon; to understand how people inhabited and utilised the landscape; to establish any degree of variability between the coast and the interior; and to establish any degree of regionality in the material culture. The overall intention was to interpret the evidence in terms of a social archaeology of the period. The evidence gathered from both the museum research and the fieldwalking programmes have shown that evidence for the Mesolithic in the west has gone unrecognised. A belief in the paucity of the archaeological record for the period can easily become a self-fulfilling prophesy – as no one is out there investigating the period it is left unknown. 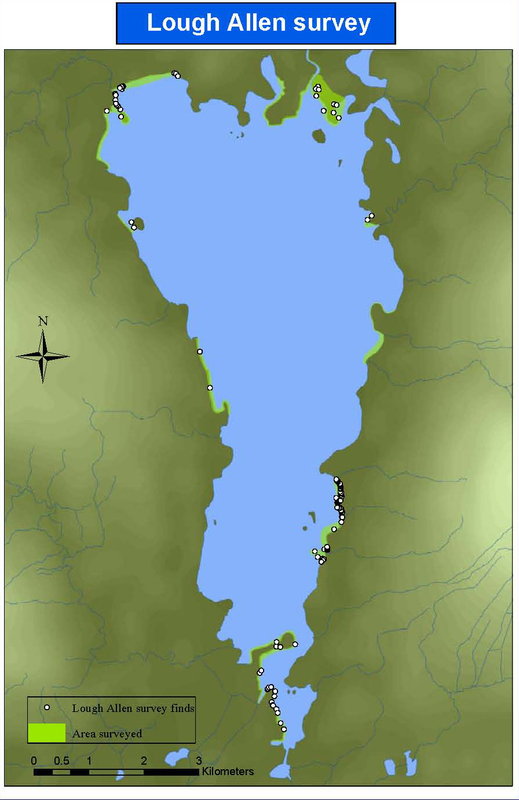 In areas such as Lough Gara and Lough Allen, this thesis has shown that the extent of the available evidence has been overlooked, while the fieldwork in Lough Allen has shown that there is extensive evidence available to be researched. What these two lakes also highlight is the serious bias at play in the known distribution of the evidence. Where lakes have been drained, much evidence can be found, but this creates a bias against areas away from the shores, such as the hinterland of the lakes as well as against lakes where no drainage has taken place. As is a commonplace, the bias towards the northeast has a lot to do with the extensive diatomite cutting that has been carried out there. Looking at the distribution of coastal sites compared to inland sites, it is clear that only the tip of the iceberg of coastal sites has been realised. Looking at the issue of regionality of the material culture, a careful analysis of the assemblages from Lough Allen, Lough Gara, and Belderrig can help in teasing out such issues. This thesis has argued that a landscape approach is a useful way of understanding early prehistoric communities. By adopting a dwelling perspective, we can situate the communities in the landscape, and understand that these communities had complex relations with the world around them. The evidence of the platforms suggest that these communities were actively engaged with the landscape, and actively transforming the landscape. Rather than seeing the landscape as a backdrop to activities, the idea of the taskscape unites the communities with the plants, animals, and the topography with the temporality of the landscape. While we do not need to argue that the Mesolithic communities were clearing large patches of woodland (why would they have needed to? ), the evidence suggests that there was more involved than skirting along the woodland edges. These were a people at home in the woodlands. Indeed, the woodland was their home. The ephemeral single finds and lithic scatters that make up the evidence for the Mesolithic – which are usually glossed in economic terms – show us evidence of these taskscapes and belie the complexity of the societal structures of the Mesolithic. As the recent site of the fishing traps, weirs, and platform has shown, a single blade found at a locale may represent many generations of activity in the area, and that we can’t expect the Mesolithic communities to have been like Hansel and Gretel with their lithic deposition – leaving a trail to follow. Rather, the deposition of lithics ultimately rested on the complex world view of the hunter-gatherers. Again, the sites which have produced Mesolithic radiocarbon dates but no lithics forces us to acknowledge that we are blinkered by our inevitable lithic gaze. In terms of further research in the six counties, clearly much more remains to be done. This thesis was only able to spend four months in total of actual fieldwalking time. In all areas surveyed, further work is necessary. In terms of surveying ploughed fields, this has been utterly neglected in the west. This thesis’ fieldwalking programme in the Tawin/Maree area is, as far as I am aware, the first such project in the west of Ireland. As the amount of land under tillage is rapidly declining in the west, I suggest that much work must be carried out in order to use this convenient access into the prehistoric landscape. In areas where no tillage is carried out, such as near the Streamstown finds and Lough Urlaur, test pitting and geophysical surveying of a wide area could be carried out. This may not produce evidence quickly, but is a start if we wish to move beyond our current finds.